Herbiceps Forum - Movies with armwrestling action? Latest info can be found on the YaBB Chat and Support Community. 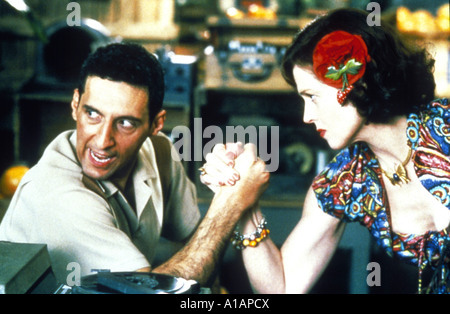 Herbiceps Forum › General Topics › Armwrestling & Strength › Movies with armwrestling action? Re: Movies with armwrestling action? Great selection of stuff dude - you're all over this! Don't know if you have seen this, but I found it recently. This is a scene from an 80's tv-series called "Murder, She Wrote", from the episode "Funeral At A Fifty Mile". Thought that actress looked familiar, so I looked it up. Its 1985, Season One, Episode 21, and the woman is the lovely Stella Stevens. Not sure who the guy was, but looking at the cast, it may have been J.D. Cannon. I agree. Don't remember seeing that. I only wish Stella had taken off her coat and not just some jewelry. BTW, the vanquished was Clu Gulager. We had a discussion about this back when. Its a promo pic. How about movies ABOUT armwrestling?